"I hate a song that makes you think that you are not any good. I hate a song that makes you think that you are just born to lose. Bound to lose. No good to nobody. No good for nothing. Because you are too old or too young or too fat or too slim too ugly or too this or too that. Songs that run you down or poke fun at you on account of your bad luck or hard traveling. I am out to fight those songs to my very last breath of air and my last drop of blood. I am out to sing songs that will prove to you that this is your world and that if it has hit you pretty hard and knocked you for a dozen loops, no matter what color, what size you are, how you are built. I am out to sing the songs that make you take pride in yourself and in your work." Essentially, local musicians are invited to perform a track or two from one classic album every month. It's a fantastic idea on several levels. I've been to half a dozen of these shows now, and none were more exciting to me than the one that happened this past week. 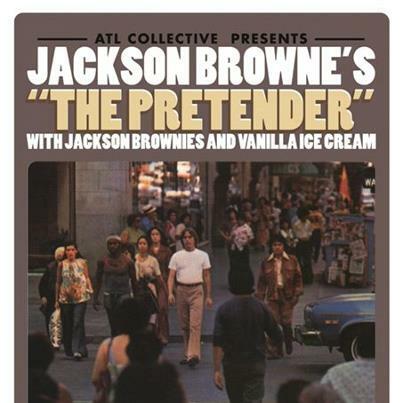 They covered my second (or third) favorite album of all time, Jackson Browne's "The Pretender." Now, calling an album on of my "favorites" is a pretty easy and ultimately low-impact thing to do. I have lots of "favorite albums." 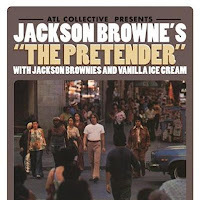 But, understand that when I call Jackson Browne's "The Pretender" one of my favorite albums of all time, I mean this: I would not be the songwriter, the musician, the fan of music, the human being that I am today were it not for Jackson Browne's "The Pretender." This album has been as much of my developing musical identity as any album ever has been. When I was a kid, I distinctly remember going to the basement, rummaging through my dad's old records, and pulling out The Pretender time and time again. I learned how to use a record player with this album. I've sat and memorized every word of every song on that album. It's a big deal. The appeal of this album to me was the unrivaled songwriting of Jackson Browne. He's a genius in his art. There's this real and down to earth quality to his lyricism. He expresses such abstract emotion through the way he writes. He has this ability to say things in a way that I, as the listener, can hear and say, "Yeah. I get that." I identify with his sorrow, with his loss, and ultimately, with his hope. He was the first songwriter to make me feel something real and impacting. I think his career went in a direction that I didn't connect to as much, but this album spoke life into me. So, when my friend Micah Dalton told me that the ATL Collective was covering "The Pretender," I was more excited than I ever have been about an upcoming show. It's why I love the Collective. There's this transitive property to classic music that can't be duplicated or easily outdone. They really appreciate the art of it, and want to share the joy of beautiful and, often, archaic music with an audience. I was happy with their representation of it, and felt it in my soul when Eliot Bronson sang, "Oh, Lord. Are there really people starving still?" or when Wil Robertson sang, "I guess they've got a lot to do before they can rest assured that their lives are justified. Pray to God for me, babe, that He can let me slide." and then, "Close your eyes, try a few of these. I felt I was flying like a bird, so far above my sorrow. But, when I looked down, I was standing on my knees. Now, I need someone to help me, some one to help me please." They killed it. I felt the "stirring in my soul," connecting to something that was entirely outside of myself, but at the same time, entirely within me. Music does that, the ATL Collective does that. I love this town and my beautiful and talented friends that make things like the Collective happen. They fight to create, to share their art with a world that desperately needs art. Music is the silence amidst the chaos, as all that self-inflating noise out there tries to distract us with Kesha and Bi-partisan Politics. We are free from it all when we see that there is no solution within ourselves. So, you can keep the self-cleaning coffee makers and the Black Eyed Peas. I'm going to go listen to Jackson Browne's "The Pretender." The Chronicles of Erika Soto.